Now and again I get distracted from whatever I am doing and become enthralled by nature and in particular animal behavior. I love to observe, speculate and postulate on whether some behavior or trait or another is acquired (learned) or genetic. No doubt I’m wrong more often than not, but it’s the speculation that I find enjoyable. It might be cats, dogs, foxes or starlings in an urban environment or, in this case, seagulls (and crows) in a coastal environment. Strolling along Weymouth promenade this (very chilly) morning, on our way to catch the 10 o’clock train back to London, we walked amongst seagulls trying to extract (some form of invertebrate) from their tiny homes in a most fascinating way. They would pick up a shell from an area of the beach freshly exposed by the receding tide, fly over to the concreted walkway upon which were we walking and drop the shell from something just above our head height. They would then instantly home in on the stricken shell to scan the immediate are around it, as well as the shell itself, evidently in hope that the impact of the fall had been sufficient to crack the shell open and dislodge its inhabitant. My partner and I stopped momentarily as we became fascinated by the behavior of the seagulls. We remarked upon their ‘cleverness’ and their ‘ingenuity’, noting the presence of a couple of crows seemingly trying the same technique as the gulls. In my mind some questions began to form. Are the gulls able to determine whether any given shell has something living in it before deciding to attempt to break it open, or do they simply pick up shells at random in the hope that they contain something living? If they do select them at random, how many will they try on average before giving up? What do the gulls do if the shell doesn’t break, do they pick it up and try again or give up on that shell and fly back to the beach to find another? If they do try again how many attempts on average will they make? From our very short observation it did seem to me that it takes no small amount of effort to break the shells open because most of the shells I saw dropped by the seagulls didn’t break on impact. In fact some of the juveniles, who evidently hadn’t quite grasped the concept yet, were landing on the concrete and simply letting the shells slip out of their beaks with understandably poor results. This was probably as endearing to us as it was perplexing to them. No doubt they will learn, their survival probably depends upon it. Although, being ‘seaside’ seagulls they can probably just about scavenge enough human food waste throughout the winter to sustain them, but of course scavenging is a skill in itself that must be learnt. Seeing the crows mimicking the seagulls’ pick n’ drop technique intrigued me. After some musing on the fact that crows are scavengers of human food waste, it occurred to me that the only reason they find themselves on the beach front, and therefore in a position to learn from the seagulls, is because they were initially attracted there by the presence of human habitations along the coastline. In other words – bear with me while I postulate an alternate reality for a moment – if there were no people on the coast, there would be no crows either; this would mean seagulls would never get to taste chips or hot dogs, or get to poo on people, children would never get to chase seagulls or throw stones at them and crows would never learn how to sample the delights of seafood. Then again, that is all speculation. One bitterly cold December morning on a beach in Dorset a small flock of seagulls were busy procuring breakfast. With their beaks they would pick up shells freshly exposed by a receding tide, fly over to the promenade and drop them onto the concrete pathway from a reasonable height. They would do this in the hope that the shell would smash and a tasty morsel would be revealed, ready for gobbling up. A curious crow observed from a distance. It watched for a few minutes more before casually ambling over to where the seagulls were. “Morning, how are you today?” said the crow to a seagull that had just landed in front of him. Before the crow could speak again the seagull whooshed up into the air with the shell in its beak. After a few seconds the shell crashed down onto the promenade and the crow hopped back in surprise. The seagull landed and excitedly inspected the shell. The crow looked on with tilted-head fascination and saw that the seagull was beginning to get frustrated. “I say, do you mind if I ask what it is that you are doing?” inquired the crow. The seagull didn’t reply and instead whooshed up into the air again with the shell clasped in its beak. This time the crow kept its eyes on the shell and shuffled back a little in anticipation of its arrival onto the ground. The shell landed with a thump onto the concrete, bounced a little and within seconds was once again under close scrutiny from the seagull. “You don’t eat the hard bit. The soft bit’s the tasty bit,” replied the seagull. “Inside,” replied the seagull with a sigh and no small amount of exasperation. For the third time the seagull scooped up the shell with its beak and took off in a flurry of flapping. The crow looked up in anticipation, but when nothing happened, swivelled round in puzzlement. Just then there was a loud cracking sound as the shell landed behind the crow and broke into several pieces. The crow spun round in startled surprise and exclaimed, “Oh bravo!” The seagull proudly devoured its tasty reward in an instant as the crow looked on in admiration. The seagull stared in silence at the crow for several moments. 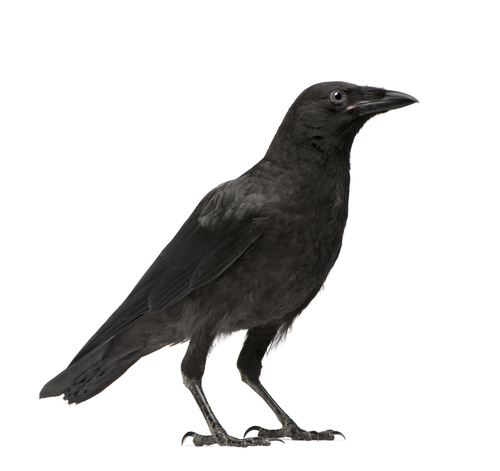 The crow shuffled slightly to one side and nervously inspected its own feet. “Absolutely not. Never touch the stuff,” retorted the crow with as much conviction as it could muster. The seagull looked quizzically at the crow for an uncomfortably long time. “You know how fussy females are!” gushed the crow, breaking the silence. The seagull stretched its wings out wide and stood tall. The crow inched back slowly and just as it began to look for the quickest escape route the seagull retracted its wings and sunk down onto its legs. “Right then, well you better come with me and I’ll show you how it’s done!” The seagull trotted down onto the beach and the crow, after breathing a sigh of relief, quickly followed.